W. Wallace Cleland passed away on Wednesday March 6th, 2013. Having taken a fall the previous Friday that that severely injured his spine, he was hospitalized where his physical condition declined rapidly. Wallace was born in 1930 in Baltimore, Maryland. He received his A.B. from Oberlin College in 1950 and his M.S. and Ph.D. from the University of Wisconsin–Madison in 1953 and 1955, respectively. After carrying out postdoctoral research at the University of Chicago, he returned to the University of Wisconsin–Madison, where he became Assistant Professor in 1959. In 1962 he was promoted to Associate Professor and then Professor in 1966. He became J. Johnson Professor of Biochemistry in 1978, and Steenbock Professor of Chemical Science in 1982. He was a pioneer in the kinetic and mechanistic study of enzymes for which he received numerous awards. William Wallace Cleland, known to his philatelic friends as “Wallace,” was one of the nation’s foremost researchers, collectors and writers on the subject of plate number and marginal markings of U.S. postage and revenue stamps. His service to organized philately is most associated with the United States Stamp Society (formerly the Bureau Issues Association). 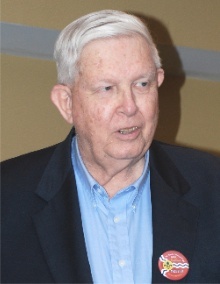 Wallace served as Chairman of the Plate Number Check List Service for many years and, in 1989, he was elected to the Board of Governors. In 1992, Wallace was elected to the Chairmanship of the Board of Governors and in August of that year also served the Society as its twelfth President through the remainder of that year. He served with distinction as the Society’s Board Chairman though 1997. Sharing his knowledge as an advisor to the American Philatelic Society and the National Postal Museum, Wallace is most recognized for his research and writing in The United States Specialist for over four decades on plate numbers and markings, coil production, Series of 1922 production, the Washington-Franklin Coil Waste Issues and revenue stamps and plate markings. He authored over 250 articles in The U.S. Specialist and the Canal Zone Philatelist. Cleland was a three-time winner of the Hopkinson Memorial Literature Award, (1986, 2002, 2006). In 2008 Wallace received the Smithsonian Institution’s Philatelic Achievement Award. In addition to authoring twelve USSS research papers and the B.I.A. Plate Number Checklist, 1-20,000, Wallace served as Durland Standard Plate Number Catalog Assistant Editor, 1994, 1997 and 2000, Co-Editor in 2005 and Editor of the 2008 and 2012 editions. In 2009, for his dedication to the United States Stamp Society and his contributions to philately, Wallace was inducted into the United States Stamp Society Hall of Fame. The passing of Wallace Cleland is sad news. Wallace and I co-taught APS seminars on coil and coil-waste stamps, collaborated on research, and vetted each other’s draft articles for more than two decades. The term “irreplaceable” is usually an exaggeration in an obituary, but in Wallace’s case it applies literally, as it did when George Brett and Charles Yeager died. Wallace is the last of the generation of scholars going back to Hugh Southgate, who had personal familiarity with Bureau of Engraving and Printing production technology, personnel and archival records. I’m ever grateful that through serendipity I happened to connect with Wallace and get involved with his research. We were on the same wavelength in terms of interests. I had the pleasure of introducing him to plate history ledgers in the National Archives that he and other philatelists were unaware of and the ledgers provided him with unambiguous virtually complete records of the plate numbers used on revenue stamps. He was absolutely thrilled with these and began making regular trips to DC to record data from them. His current project was to produce a complete list of plate numbers on revenue stamp plates from the first 10,000 numbers in the treasury intaglio plate number set. On Tuesday, December 9, 2012, he arranged to meet me for his first visit there to the Smithsonian National Numismatic Collection where most of the BEP revenue stamp proofs are housed owing to being Treasury items. For the next two days he was the proverbial kid in a candy shop sifting through certified proofs of revenue stamps and other jewels that we found that were of interest to him. He focused his attention on early beer stamps, which seemed to be his primary passion. As he searched the vault for beer stamp proofs, he was thrilled to find boxes of proofs of fermented liquor stamps, which he informed me were classified as beer stamps by philatelists. I had simply boxed them separately in alphabetical order based on the wording on the stamps. Consequently, months before when he asked about beer stamps, I couldn’t find a number of the series he wanted to see. They were “lost” way down the aisle in the fermented liquor boxes! He despaired that they had not been saved. He spent a few hours recording data from them and flagging items to scan. He also liked the early tobacco, cigar and snuff stamp proofs, especially the large format items. He kept my wife Kathy and me busy scanning his finds for an entire day. The results started appearing in The Specialist within weeks of his return to Madison. The postal service dummy postage stamps with horse and rider in the March issue were among finds that thoroughly delighted him. Wallace gave his all to philately and philately returned the favor by richly rewarded him with unending pleasure and delight. There is no question that you get what you give in this game. I benefited greatly during the past couple of years through my interaction with him. Our collaboration allowed both of us to cross fertilization our respective disciplines — stamps and currency — with ideas and perspectives from the other side of the fence. He generously put me in touch with other philatelists who shared other of my interests, allowing me to expand my circle of collaborators. That was one of his roles — the facilitator.